I have had charm packs with French Roosters by Riley Blake Designs for a little while and wondered what I would do with them. It would definitely be something for my sister because she loves roosters. So, here is the newly born table runner! 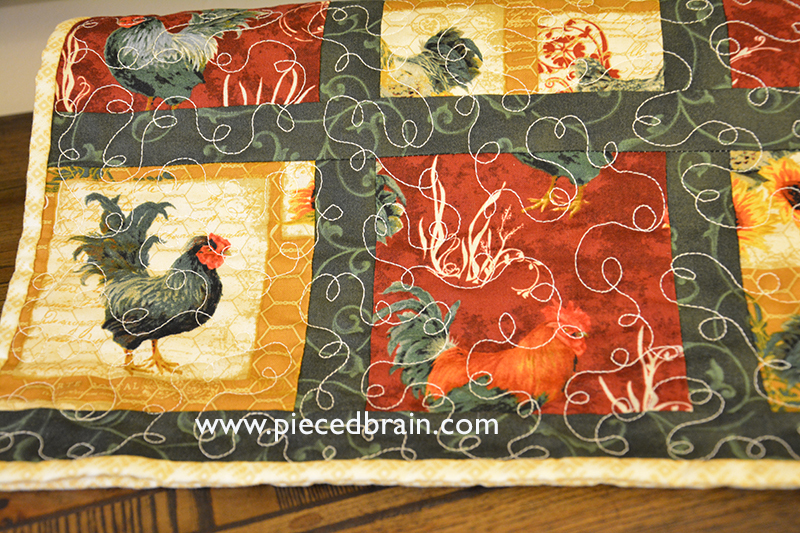 I used the roosters with red background on one end of the runner, and the ones with black background on the other end. To lighten up the project, I found a beige fabric that would do just the trick. For the sashing I picked a color that would not wash out the beige on some of the blocks, so dark green worked. 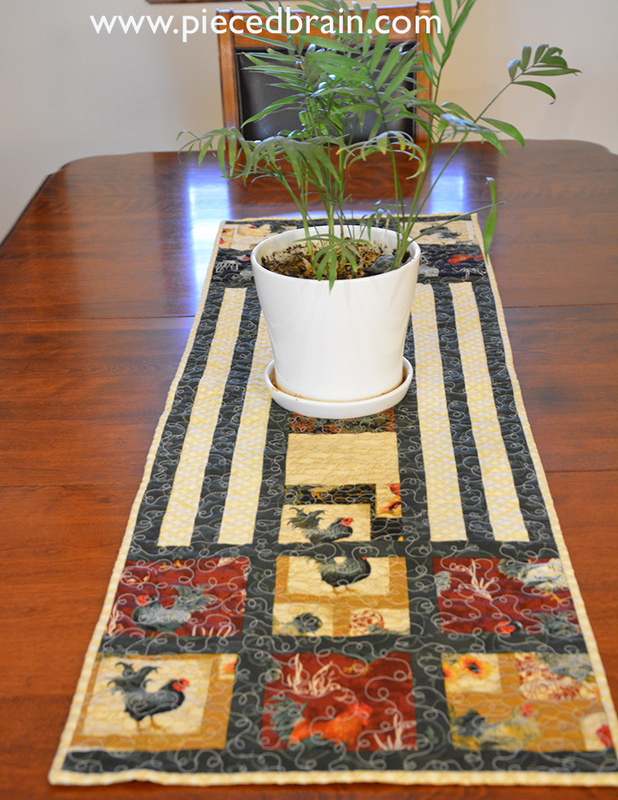 The middle of the table runner has more 5" squares from the pack. This runner measures 51-1/2" x 16-1/4", a good size for tables or coffee tables. The backing is dark red so the white quilting loops show very well. So, this is my finish for this Friday. What is yours? 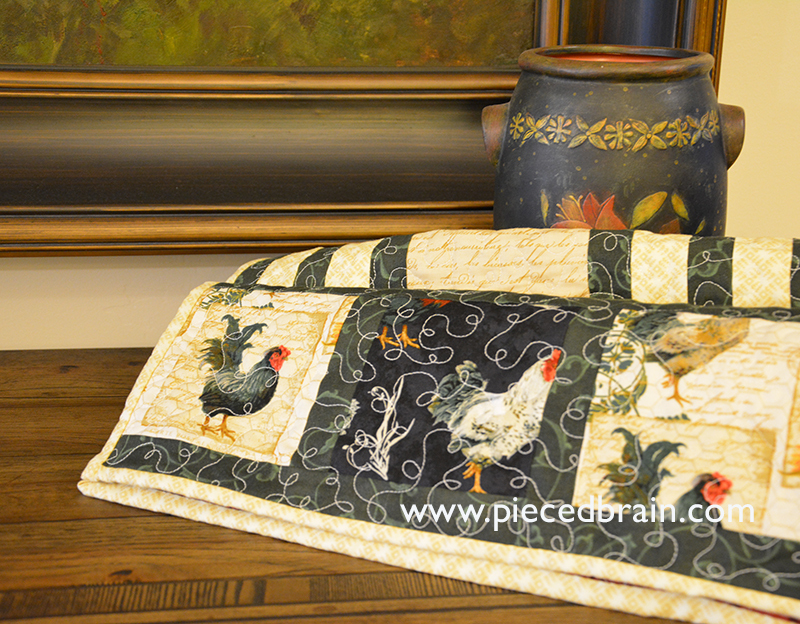 I am linking up with Crazy Mom Quilts and Confessions of a Fabric Addict. A very attractive runner. Wish it was mine. You've used the panels quite beautifully. I really like your choices for the added fabrics. Awesome runner Denise. Love the roosters and your layout and the quilting! I especially like how the white quilting thread really stands out - must be a heavier weight?